Hotel Green Top is one of the oldest and most renowned properties located amidst beautiful scenery dominated by pine trees in the Shivalik range of the Himalayas. The rooms of the hotel, decked with majestic décor and facilities, provide an absolute delight to the visitors. The unpolluted surroundings let the guests to breathe fresh air and rejuvenate the mind, body and soul. The proximity of the hotel to the famous tourist attractions such as the Gurudwara Singh Sabha, Sudh Mahadev Temple, Madhatop, Naag Mandir, provide a wonderful chance to the visitors to just relax and unwind. The Children Park that is excellently maintained with a waterfall is an ideal retreat for the kids to play and knock out the feeling of boredom. Wireless facilities in this area ensure a visitor remains connected with the world, even in the wilderness. Accommodation The rooms of the Green Top Hotel in Patnitop are elegantly designed keeping in mind the needs and requirements of the visitors. There are altogether 30 rooms classified into the double deluxe, duplex and executive rooms. 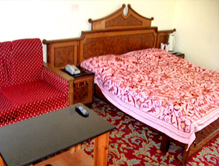 The rooms are very hygienic and well-furnished. The various in-room facilities offered by the hotel are intercom, television, direct dial STD telephone, attached bathroom, hot and cold water. Dining: Surrounded by enchanting valleys, the resort leaves no stone unturned to provide good dining experience to the guests relish traditional food along with North Indian, South Indian, Chinese dishes while engaging in funny gossips. There is also a Coffee Shop that serves finest coffee, tea, fruit juice and mocktails. 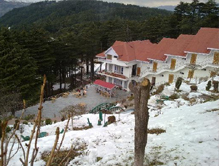 A renowned and trusted name in the travel industry, Tour My India offers a great opportunity to the tourists to avail great deals for Patnitop hotels at the company's website and exploring new vistas.